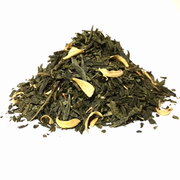 Fragrant orange blossoms with mild Sencha green tea base. A most refreshing cup. Try chilling it on a hot summer afternoon.